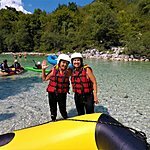 Slovenia remains one of Europe's best-kept secrets, rewarding travelers with all the charm and beauty of its neighboring countries and significantly fewer crowds. 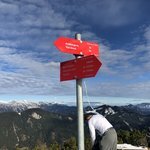 Enhance your trip with unique accommodations: choose a treehouse overlooking sparkling Lake Bled, a classic mountain chalet in the Soča Valley, or a number of other properties that will make your stay in Slovenia exceptionally memorable. No trip to Slovenia is complete without a visit to Lake Bled. 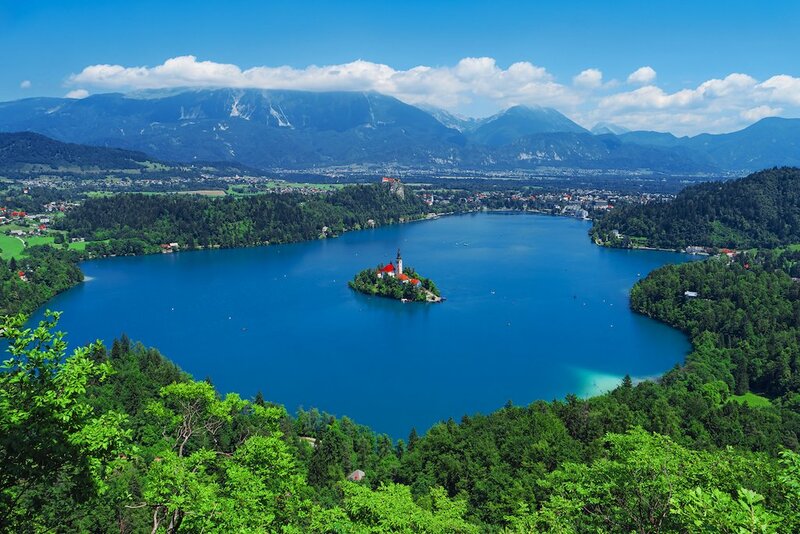 Like the backdrop of a fairytale, picturesque Lake Bled offers countless outdoor activities, and located just south of the lake is Garden Village. What makes this eco-resort so unique, besides sourcing most of its food from gardens situated on its grounds, are the wide assortment of sleeping options available to you in one place. Take an elevated approach, literally, with a real tree house—complete with trees growing right through it and an adventure hammock to sleep in. 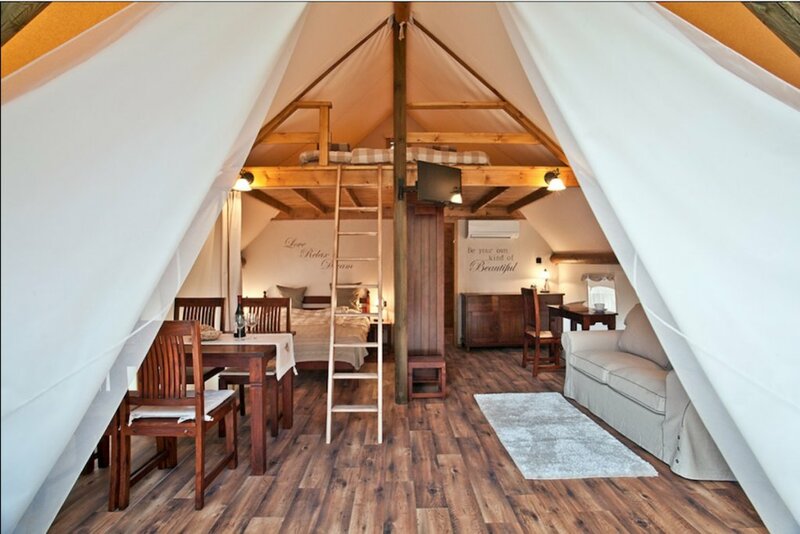 For those wishing to stay closer to the ground, choose one of two tent options: one more traditional, the other full-on glamping with a furnished, air-conditioned tent that includes a heated outdoor tub. And finally, keep things classic with a bright, airy studio apartment where you can take a bubble bath to soothe those achy muscles after an active day. Located on Slovenia's eastern edge, Soča Valley is an adventurer's heaven offering nearly anything you could think of from hiking and climbing to mountain biking, ziplining, and even paragliding. And there may be no better place to stay than Nebesa. 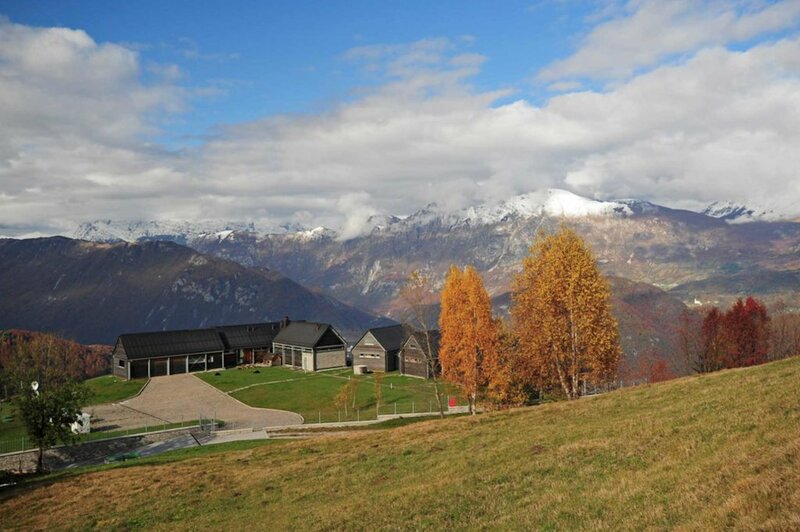 Nebesa means 'heaven' in Slovenian, so its only fitting to stay at one of these four mountaintop chalets located up a steep winding road roughly 2,700 ft above sea level. Wake up above the clouds in comfort to serene mountain views and take advantage of the wellness center complete with a sauna, or grab a bike and take a ride. And while they don't include a prepared breakfast, feel free to fix yourself a morning meal at your leisure with a full fridge that gets restocked daily. Want something fancier? Head down to Hiša Franko, which is featured on multiple "top restaurants in the world" lists and happens to be run by self-taught chef Ana Roš, the World's Best Female Chef of 2017 and daughter of Nebesa owners Katja and Bojan Roš. In the mountainous northern region of Slovenia, inside the quaint little village of Luče, you'll find Hiša Raduha. From its contemporary architecture, you'd never guess it's been hosting guests since 1875. With luxurious furnishings and a top-notch restaurant, the 30 or so guests can choose from a handful of unique accommodations. The hayrack sleeps four with a bedroom and living room on the top floor and a meditation area with jacuzzi below. 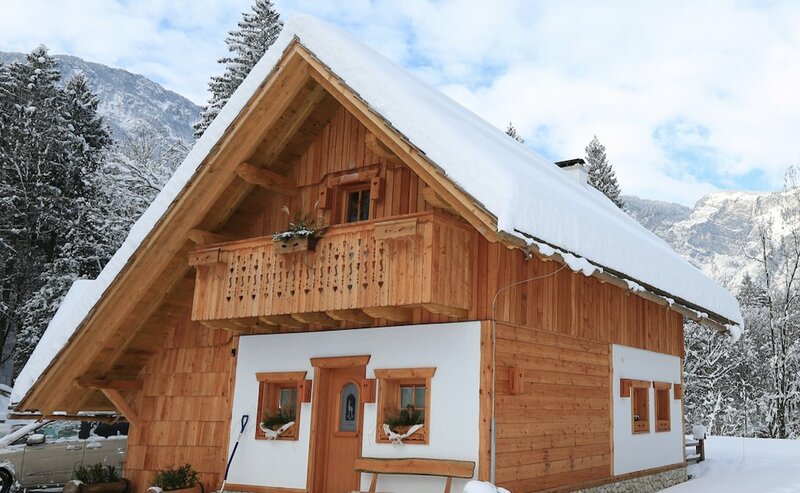 Above the barn, you'll find two airy apartments with modern furnishings complete with an indoor hot tub (perfect for travelers visiting during winter months). And finally, a little tree house (technically on stilts, but surrounded by trees) to offer guests plenty of privacy for when they use — you guessed it — yet another private hot tub. What combination is vastly underappreciated? Camping and wine! Thankfully Chateau Ramšak has travelers covered who are looking for the best of both. 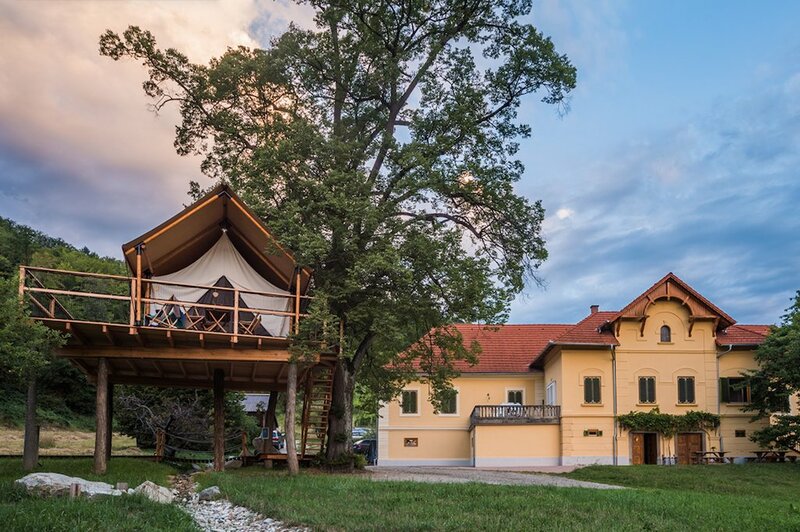 Situated on nearly 40 acres near the city of Maribor in the wine region of Styria, wake up overlooking an operating vineyard complete with wine cellar and even Europe's largest wine press. Chose from accommodations that include a tree house or luxurious glamping tents complete with A/C, wifi, and a private hot tub. Relax with a walk through their vineyard, a unique wine massage with grape peel, or cool down by dipping your toes in their natural pond. And, of course, sample their many wines with a tasting. Located in the region of Bela Krajina in southeast Slovenia, the village of Podlog near the Lahinja river boasts a resort called Turizem Malerič. In addition to six apartments, the real star attraction are four modern pods with names like "Yellow Sun" and "Red Flower" that reside next to a natural pool which uses no chemicals but is cleaned naturally by plants and microorganisms. 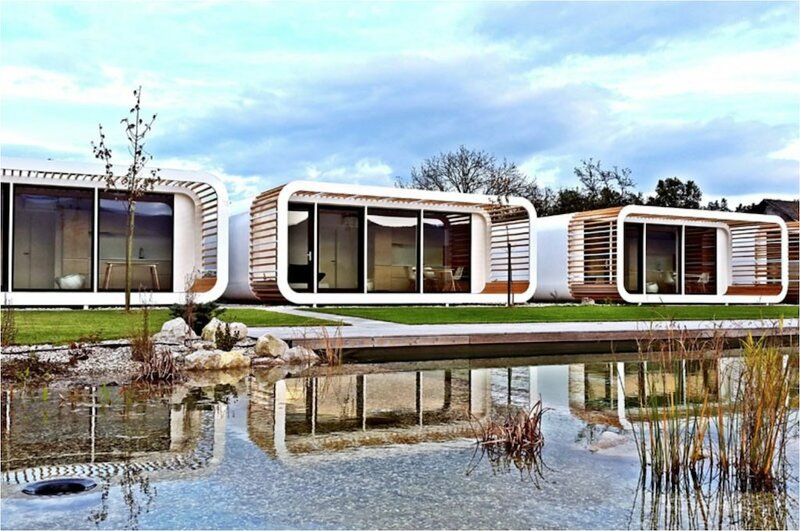 Each pod sleeps four with additional beds and features natural wood floors, walls, and ceilings as well as a full kitchen and dining area soaked in light thanks to floor-to-ceiling glass that slides open to a large wooden terrace. After a day of biking, boating, or taking a wine tour (be sure to try regional varieties like Belokranjec and Metliška črnina) take in the views or relax in their Finnish sauna and whirlpool. 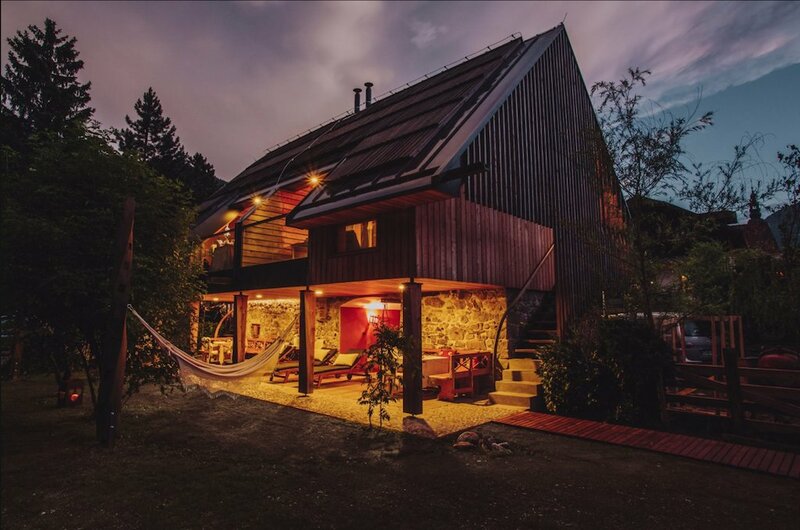 If ultra-modernism isn't your thing and you want a more traditional Alpine experience, head to Apartmaji Alpik, Bohinj located on the western shore of one of Slovenia's other stunning lakes, Lake Bohinj. 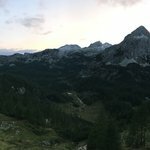 Being located in Triglav National Park means no matter what time of year it is, there is something to do, from swimming and climbing in summer to skiing in winter. 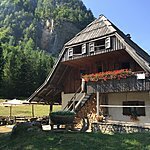 The well-furnished complex only sleeps 27 total, so you know it won't be too crowded, and you are nearby to everything from the stunning Savica Falls to the quaint town of Ukanc where you'll find a couple of restaurants to stop for a meal. If you prefer the city life and are looking for an affordable place to stay in Ljubljana, why not just spend the night in jail, sorta? 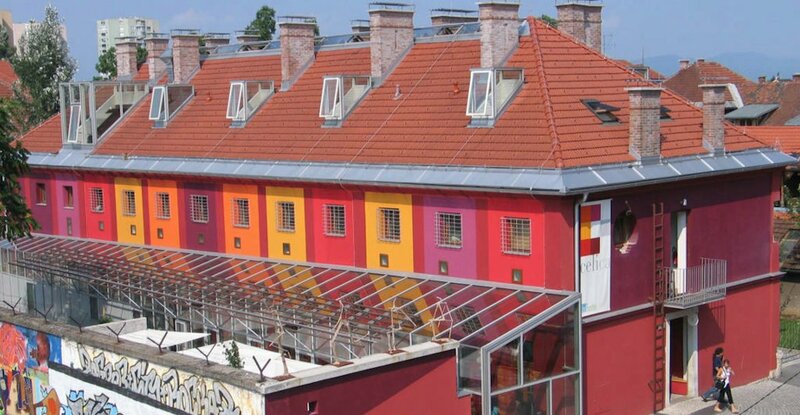 Located in Metelkova Mesto, which is best described as the Williamsburg of Ljubljana, Hostel Celica is a former 19th-century prison turned hostel and art gallery where they've converted the cells into tiny rooms, each designed by a different local artist. While each cell sleeps 2-3, if you are traveling with more people they also offer a handful of rooms and dorms that sleep up to seven, although none of those match the creativity of the cells. While in Ljubljana you may as well take a stroll through Prešeren Square across the famed Tromostovje (Triple Bridge) or take the fairytale Dragon Bridge up to Ljubljana Castle while enjoying the Jože Plečnik-designed architecture—you can even visit the famed architect's bachelor pad.